Salesforce Knowledge is the knowledge base solution that is part of the Salesforce Service Cloud, a comprehensive package of components and modules that gives you a complete customer view and enables you to provide intelligent, fast, and personalized customer service. The array of solutions under Service Cloud connects and works with each other to help you streamline processes, simplify workflows, and easily make available important articles, information, and expert agents to your customers, regardless of what device and channel they use. Salesforce Knowledge is designed for self-service so your customers can search for helpful information and resources on their own about issues relating to your business, product or services. Likewise, the solution enables your agents to find the right answer faster with a knowledge management tool that can help you extend responsive and efficient customer care. With the online public knowledge base platform, you help your customers help themselves with easy access to knowledge base articles, FAQ, and the collective wisdom of the active Salesforce community. Quickly set up a database of “how-to” article and FAQs that’s easily accessible online so your customers can do self-service or empower your customer service agents to find the right answer faster. The knowledge base drives speedy case resolution and quality customer care. Extend your knowledge base to your service website, whether it’s a secure customer or partner portal, part of your public site, or integrated into a public customer community. You get to provide an effortless customer experience where knowledge is accessible from any mobile device. 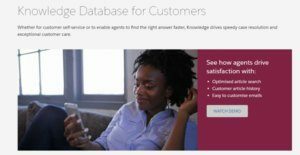 With a cloud-based knowledge base embedded right into the console, your agents can easily find, access, and deliver the right answers to customers. Also, sharing knowledge to any channel or device is only a one click operation. In addition, your agents can contribute to the knowledge base to ensure that the best answers are always accessible to the whole team. You get the ability to set up custom review and publication as well as translation approval. You can set separate approval processes for each type of content and specify the managers for specific content. You can also control the visibility of your content for specific group or audiences. Apply industry best practices and ensure the accuracy of articles with the first KCSv5 verified knowledge management and incident management solution. Moreover, you can utilize an article rating system to monitor the usefulness of your content and get important metrics on content rating, usage, and search statistics to manage your articles. If you are interested in Salesforce Knowledge it could also be beneficial to check out other subcategories of Best Knowledge Management Software collected in our base of SaaS software reviews. Every company has different needs and requires a system that can be customized for their size, kind of staff members and clients, and the specific industry they are in. For these reasons, no platform can offer perfect tools off-the-shelf. When you look for a software product, first be sure what you need it for. Read some Salesforce Knowledge reviews and ask yourself do you want basic features or do you need advanced features? Are there any industry-specific tools that you are seeking? Get the answers to these queries to aid your search. There are lots of factors that you need to reflect on and these include your budget, particular business requirements, your organization size, integration requirements etc. Take your time, try out a few free trials, and finally select the app that offers all that you want to enhance your firm efficiency and productivity. How Much Does Salesforce Knowledge Cost? Salesforce Knowledge is offered as a feature license add-on to most Service Cloud editions. The read only version is included in the Lightning Professional plan ($75/user/month) and Lightning Enterprise plan ($150/user/month) but will entail additional costs if you opt for the read/write version of Knowledge on those two plans. Meanwhile, the read/write version is already part and parcel of the Lightning Unlimited plan ($300/user/month). We realize that when you make a decision to buy Knowledge Management Software it’s important not only to see how experts evaluate it in their reviews, but also to find out if the real people and companies that buy it are actually satisfied with the product. That’s why we’ve created our behavior-based Customer Satisfaction Algorithm™ that gathers customer reviews, comments and Salesforce Knowledge reviews across a wide range of social media sites. The data is then presented in an easy to digest form showing how many people had positive and negative experience with Salesforce Knowledge. With that information at hand you should be equipped to make an informed buying decision that you won’t regret. What are Salesforce Knowledge pricing details? What integrations are available for Salesforce Knowledge? Salesforce Knowledge integrates with solutions in the Salesforce Service Cloud platform including Field Service, Case Management, and Digital Channels, among others.